You have a bona fide Git repository and a checkout or working copy of the files for that project. You need to make some changes and commit snapshots of those changes into your repository each time the project reaches a state you want to record. Remember that each file in your working directory can be in one of two states: tracked or untracked. Tracked files are files that were in the last snapshot; they can be unmodified, modified, or staged. Untracked files are everything else — any files in your working directory that were not in your last snapshot and are not in your staging area. When you first clone a repository, all of your files will be tracked and unmodified because you just checked them out and haven’t edited anything. As you edit files, Git sees them as modified, because you’ve changed them since your last commit. You stage these modified files and then commit all your staged changes, and the cycle repeats. This lifecycle is illustrated in Figure 2-1. Figure 2-1. 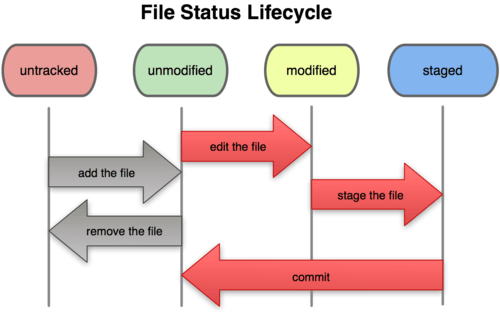 The lifecycle of the status of your files. This means you have a clean working directory — in other words, no tracked files are modified. Git also doesn’t see any untracked files, or they would be listed here. Finally, the command tells you which branch you’re on. For now, that is always master, which is the default; you won’t worry about it here. The next chapter will go over branches and references in detail. You can tell that it’s staged because it’s under the “Changes to be committed” heading. If you commit at this point, the version of the file at the time you ran git add is what will be in the historical snapshot. You may recall that when you ran git init earlier, you then ran git add (files) — that was to begin tracking files in your directory. The git add command takes a path name for either a file or a directory; if it’s a directory, the command adds all the files in that directory recursively. The first line tells Git to ignore any files ending in .o or .a — object and archive files that may be the product of building your code. The second line tells Git to ignore all files that end with a tilde (~), which is used by many text editors such as Emacs to mark temporary files. You may also include a log, tmp, or pid directory; automatically generated documentation; and so on. Setting up a .gitignore file before you get going is generally a good idea so you don’t accidentally commit files that you really don’t want in your Git repository. Glob patterns are like simplified regular expressions that shells use. An asterisk (*) matches zero or more characters; [abc] matches any character inside the brackets (in this case a, b, or c); a question mark (?) matches a single character; and brackets enclosing characters separated by a hyphen([0-9]) matches any character in the range (in this case 0 through 9) . A **/ pattern is available in Git since version 1.8.2. If the git status command is too vague for you — you want to know exactly what you changed, not just which files were changed — you can use the git diff command. We’ll cover git diff in more detail later; but you’ll probably use it most often to answer these two questions: What have you changed but not yet staged? And what have you staged that you are about to commit? Although git status answers those questions very generally, git diff shows you the exact lines added and removed — the patch, as it were. It’s important to note that git diff by itself doesn’t show all changes made since your last commit — only changes that are still unstaged. This can be confusing, because if you’ve staged all of your changes, git diff will give you no output. Doing so launches your editor of choice. (This is set by your shell’s $EDITOR environment variable — usually vim or emacs, although you can configure it with whatever you want using the git config --global core.editor command as you saw in Chapter 1). You can see that the default commit message contains the latest output of the git status command commented out and one empty line on top. You can remove these comments and type your commit message, or you can leave them there to help you remember what you’re committing. (For an even more explicit reminder of what you’ve modified, you can pass the -v option to git commit. Doing so also puts the diff of your change in the editor so you can see exactly what you did.) When you exit the editor, Git creates your commit with that commit message (with the comments and diff stripped out). Notice how you don’t have to run git add on the benchmarks.rb file in this case before you commit. To remove a file from Git, you have to remove it from your tracked files (more accurately, remove it from your staging area) and then commit. The git rm command does that and also removes the file from your working directory so you don’t see it as an untracked file next time around. This command removes all files that end with ~. Unlike many other VCS systems, Git doesn’t explicitly track file movement. If you rename a file in Git, no metadata is stored in Git that tells it you renamed the file. However, Git is pretty smart about figuring that out after the fact — we’ll deal with detecting file movement a bit later. Git figures out that it’s a rename implicitly, so it doesn’t matter if you rename a file that way or with the mv command. The only real difference is that mv is one command instead of three — it’s a convenience function. More important, you can use any tool you like to rename a file, and address the add/rm later, before you commit.